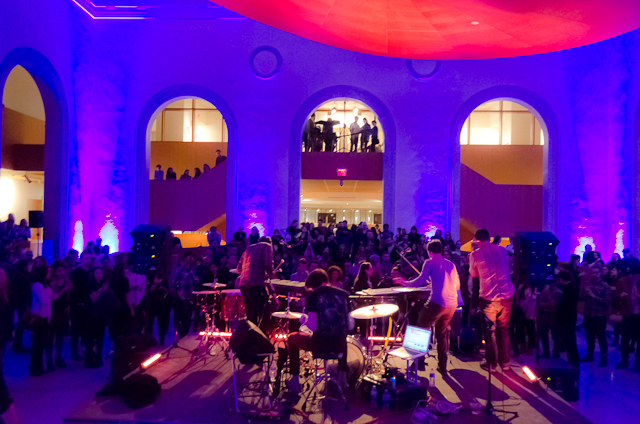 When the Art Gallery of Ontario (AGO) started holding First Thursday art parties, Toronto’s young and creative set found a unique space to have a lively night out. With pop-up bars, food stations, art-making activities and musical performances, art-loving party-goers have after-hours access to one of the largest museums in North America. From 7:00 to 11:30 p.m. on the first Thursday of each month, visitors can roam the downtown gallery’s permanent and special exhibitions with their drinks, friends and smartphone cameras in tow. The gallery’s permanent collection holds over 80,000 pieces, representing various artistic movements and eras of art history. It is no surprise that the AGO houses the world’s largest collection of Canadian art, as well as an expansive body of works from the Renaissance and the Baroque eras, European art, African and Oceanic art, and a modern and contemporary collection. The party is centred on the museum’s main floor in Walker Court, where the stage becomes quickly surrounded by indie music fans. 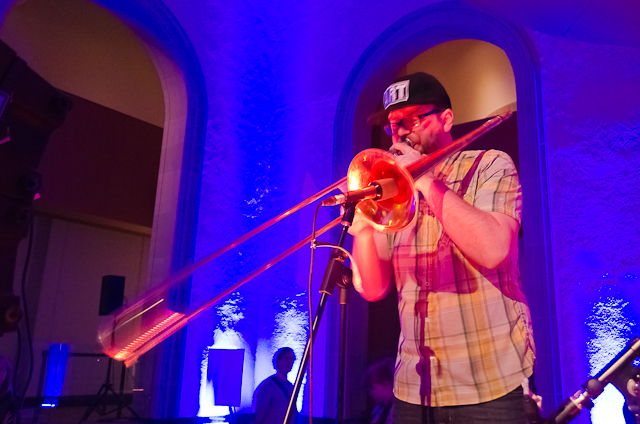 The most recent First Thursday event featured musical performances by DJ duo Tape Deck Bros., Toronto rapper Tasha The Amazon, and collaborative organic/electronic music project Pick a Piper (featuring Caribou’s Brad Weber). During the event, pop-up bars are based in the lobby and main court. Food stations offer appetizers such as pulled-pork tacos, spicy tomato soup, chili chocolate brownies and sweet and salty kettle corn. Interactive art-making activities (think arts and craft tables) are sprinkled throughout the gallery. First Thursdays run year-round and don’t have specific themes. 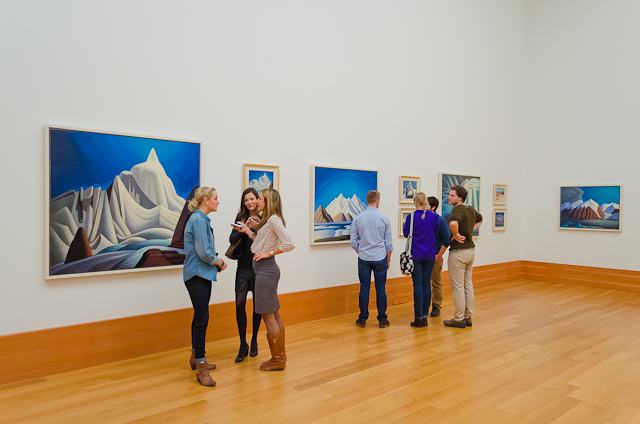 Instead, they are loosely based on events on major city happenings or the gallery’s exhibits. First Thursday visitors can access special exhibitions for an additional cost, currently The Great Upheaval: Masterpieces from the Guggenheim Collection, 1910-1918. 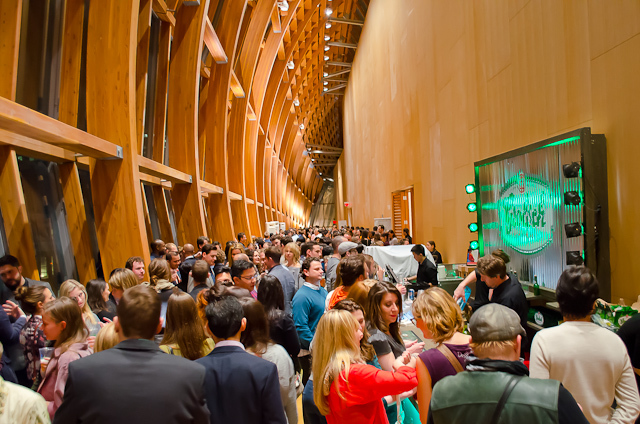 The AGO’s First Thursday parties complement monthly party nights held at Toronto’s other major museum, the Royal Ontario Museum (ROM). AGO’s First Thursday parties regularly sell out, showing how they effective they are at getting young people excited about visiting a museum. 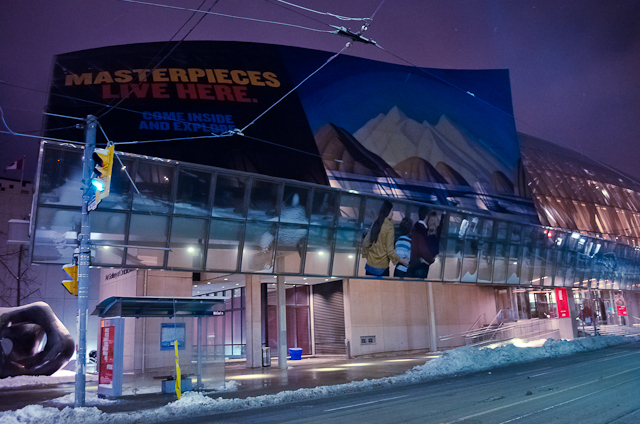 This entry was posted in Stuff we love, Toronto and tagged AGO, Art Gallery of Ontario, art party, First Thursdays, Toronto. Emily (Toronto) is a Toronto based writer and photographer who was bitten by the travel bug after living in Ireland for a year. She has since visited and photographed over 25 destinations around the globe, from Paris to Peru and Morocco to Miami. When she is not writing or taking photos she can be found at a local pub, planning her next trip, or some combination of both. / Say hello on Twitter @EmilyBaillie or on Instagram @emilybailliephoto.